We love the people of Belper and want to make a difference to our community. To acheive this we work closely with others through 'Hope for Belper', which aims to provide for individual and community needs in the Belper area. 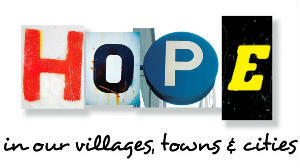 Christian's Against Poverty - Belper Debt Centre , helping people in debt find hope and a solution. Belper Street Angels - Providing a caring presence on the streets on Friday and Saturday nights. The Basic Idea - Helping people in need with food parcels. There are boxes in each of our three churches for donations of non-perishable food items and toiletries. Please buy from this list only-Tinned meat pies, tinned potatoes, sugar, sponge puddings, Angel Delight, UHT milk, individually wrapped toothbrushes, toothpaste. Please do not give baked beans, soup, tinned fish, tinned tomatoes or pasta. Thank you for your continued support.